With Consumer Grade DSLR and Low End Lens, Bokeh Will Start to Show Various Distortions. 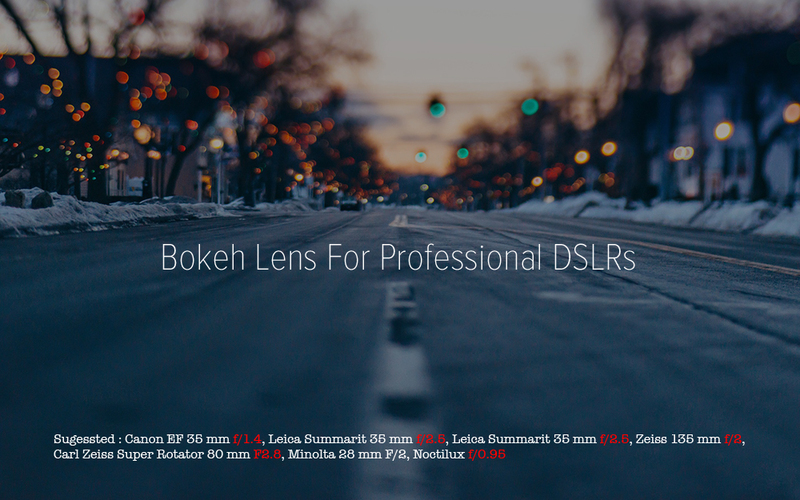 Here Are Some Good Bokeh Lens For Professional DSLRs. Wider opening from f/0.95 to f/2.5 usually create great quality of bokeh in general. Frankly, creating a dreamy background with very good quality bokeh demands good bodies, safely excluding consumer grade DSLRs from Nikon and Canon. There are lot of good, old brands. Nikon (Estd. 1917) and Canon (Estd. 1937) are also older companies, but unfortunately the marketing target has been odd for the both. Leica (Estd. 1849) and Hasselblad (Estd. 1841) are almost the standard camera manufacturers for the rich serious hobbyists and the high end professionals. Konica is quite older company (Estd. 1873). VoigtlÃ¤nder is running business since 1756. You can fight with us, but basically these are the facts. Your spending will frankly determine the end result. Leica and Zeiss both manufacturers good glass in this context. Sadly, the diaphragm blades are least talked technical part by most of the bloggers and authors. One can use a Canon 1000D and Nifty Fifty, we have nothing to criticize about. But do not cry if the bokeh becomes elliptical at the ends of show halo effect. Camera does not take photograph, the techniques and artistic sense compose the photographs. A large aperture, a good distance with the illuminated background and subject, longer focal lengths, a fast lens make better bokeh. Normal lens is preferred over zoom lens for lens design. Bokeh is infamous for spoiling the mood and composition of the photograph. We have not categorized in to wide angle, normal, zoom etc. All are equally good. Canon EF 35 mm f/1.4 : Current price is around 1500 USD. Leica Summarit 35 mm f/2.5 : Current price is around 1700 USD. Zeiss 135mm f/2 : Current price is around 1900 USD. Voigtlander 17.5mm f/0.95 : Current price is around 900 USD. Hartblei/Carl Zeiss Super Rotator 80mm F/2.8, Minolta 28mm F/2 are other good lens. Noctilux f/0.95 (current price is around 10K USD) also creates bokeh but the tendency is towards a smooth blur. These lens are good bokeh lens for professional DSLRs. The three lens we listed are well known and tested for the typical bokeh effect people wants. Nocti is our preferred as it is kind of allrounder. This Article Has Been Shared 5387 Times! Noise Reduction in Digital Photography is Quite Frequently Discussed Topic. There are some ways which we can use to cover up this issue. What is Centre of Interest in Photography? Centre of Interest usually relates to composition in Nature related Photography. The terminology is derived from traditional painting. What Determines the Quality of Bokeh? What Determines the Quality of Bokeh? Bokeh may be creative or add an artistic flavor but clearly we should avoid bad quality of bokeh. Cite this article as: Abhishek Ghosh, "Good Bokeh Lens For Professional DSLRs," in The Customize Windows, May 29, 2015, April 21, 2019, https://thecustomizewindows.com/2015/05/good-bokeh-lens-for-professional-dslrs/.